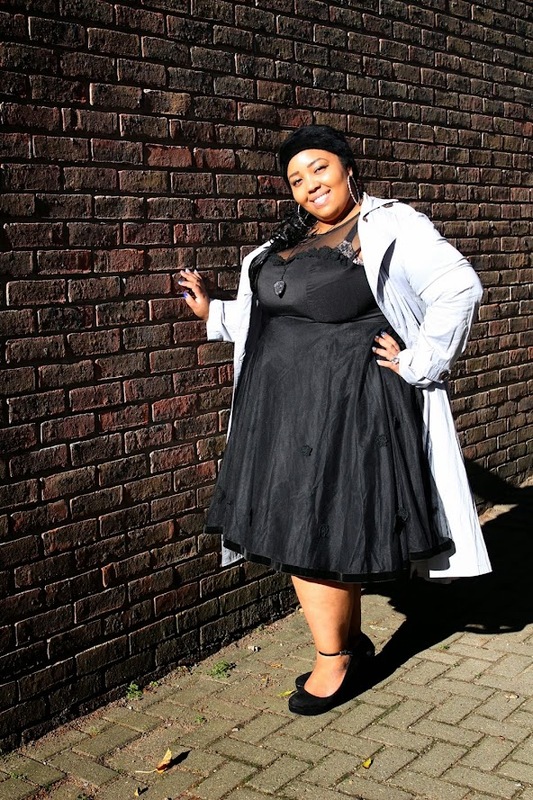 As I mentioned in my last review of Collectif most of their clothes range from a size 6-22 so it really is worth looking them up as there tends to be something for pretty much everyone. I decided to treat myself to the Dietrich Swing Trench Coat for my birthday this year. 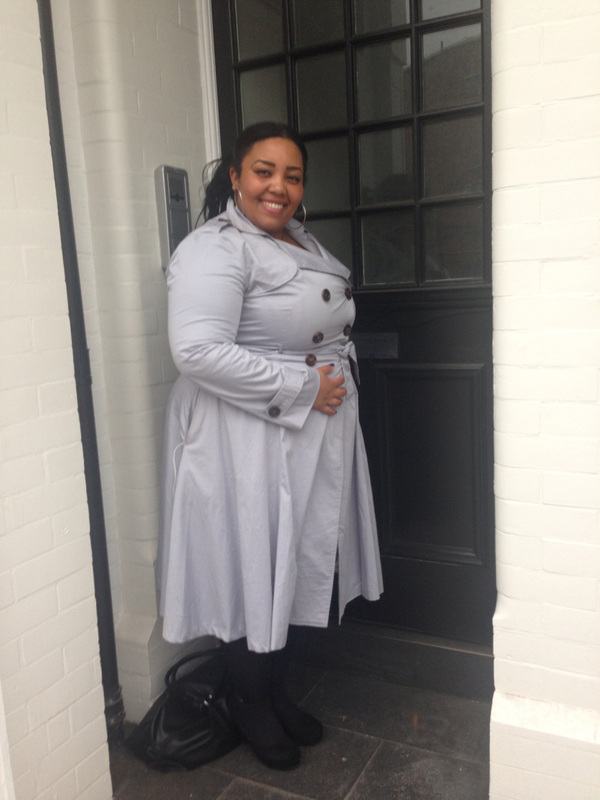 Unfortunately the coat was sold out in my size and colour in all of the stores and the website! I guess ladies everywhere felt the same way as me when they saw the piece online. 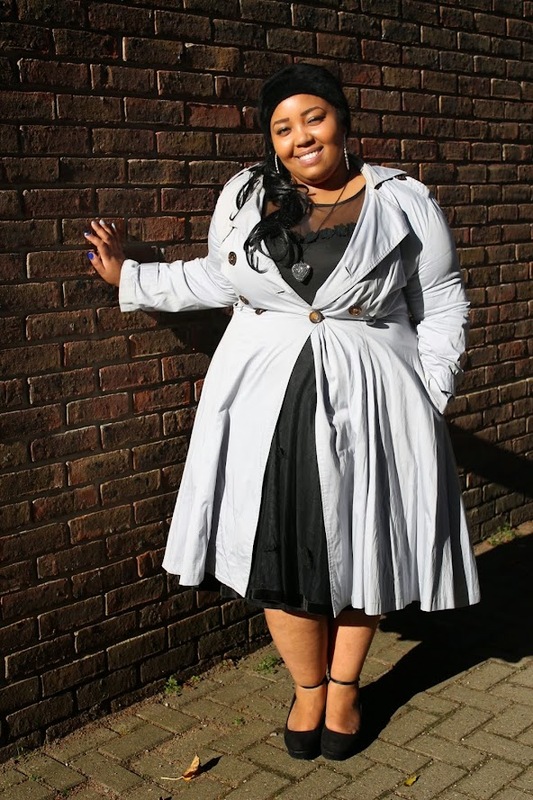 I first came across this coat when I saw it on the Collectif Facebook page and another fashion blog. It just so happened that when I called the customer service team at Collectif to get some info on sizing for a dress that I had my eye on, that I asked when this coat would be back in stock. To my luck the member of staff at the company who was helping me with my enquiries was the lovely Julia Metz; Company Buyer and Assistant Manager. Julia not only gave me very detailed info on the Dolores Doll Dress (review to come very soon) and Sindy Doll Dress. 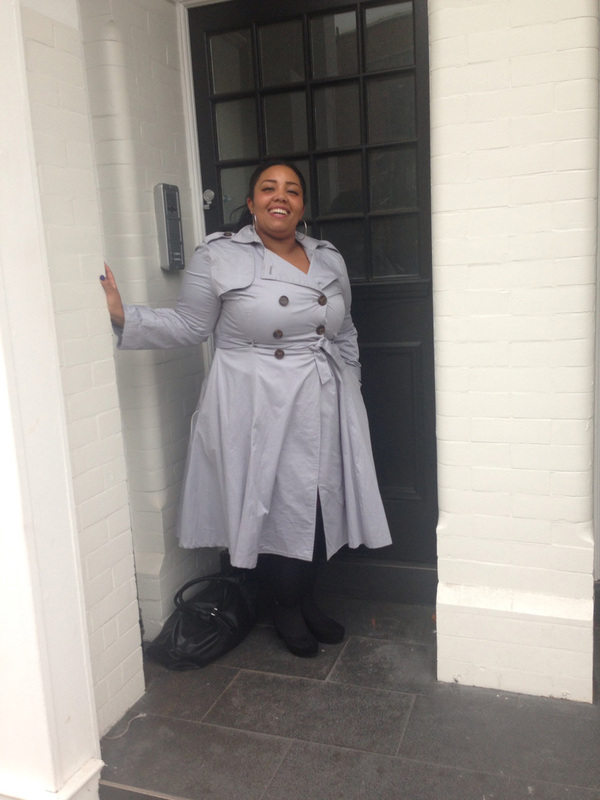 After talking for a while she called me and told me that she stumbled across the Dietrich Swing Trench Coat in size 22 and that she would hold it for me if I still wanted it. I was so happy! I had been trying to find this item everywhere! And the best part; it was in the colour I wanted, powder blue. I absolutely love this coat the fabric is light and warm, so this jacket for me is perfect to be worn in the summer and the autumn months. I don’t think the material would be heavy enough to take on the cold winters that we have here in the UK but I personally would try it and would wear some heavy tights and Petticoat with my dresses for extra coverage. I love the silky soft feel of the material and the beautiful floral lining. I will be honest, if like me you have a rather big bust then you may want to go up a size as it is rather snug in that area. This is one that I have worn in warm and cool days and have felt comfortable in it on both occasions. 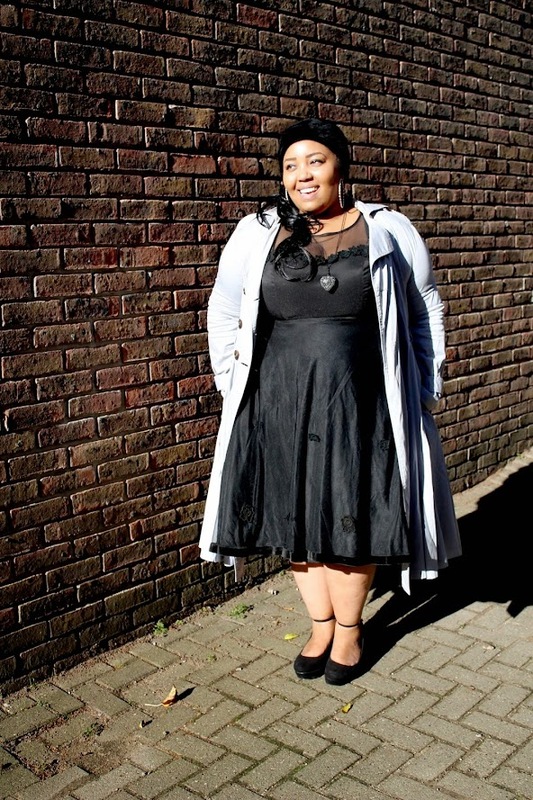 This dress can be worn with wiggle, pencil or swing dresses and of course separates. It’s the perfect length and has enough room to sit perfectly around your skirt, giving you coverage and still showing off your great outfit choice. This one also comes with a belt to cinch you in and give you an even more defined shape should you chose to wear it closed. With the outer coat being 98% Cotton 2% Elastane and the lining 97% Polyester 3% Elastane the fit and quality for me is just perfect! Depending on the look you want to achieve you can really play around with this coat. I have worn it in a more casual style with bodycon dress underneath (as seen in the pictures above) and I paired it with simple black tights and black platform shoes. 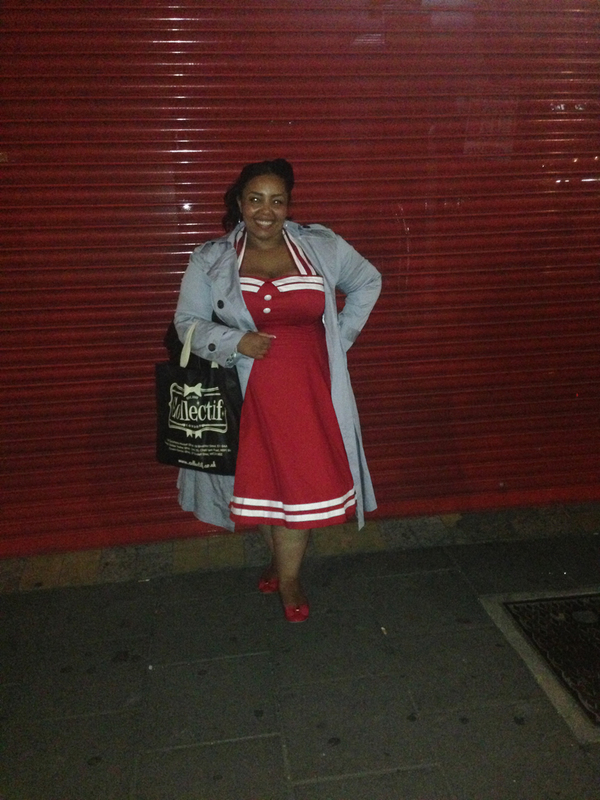 I have also worn this a lot more dressy and paired it with my Collectif Vintage dresses and flat shoes.